In 2001, according to the Resolution of the Cabinet of Ministry of Ukraine, No. 1678, the State Historical and Cultural Preserve in the Town of Belz was created. Starting from December 25, 2011, the preserve was trunsferred under control of the Ministry of the Culture of Ukraine. The preserve is a scientific, research, cultural and educational establishment, which ensures detection, research, preservation, popularization, and usage of the cultural heritage of Belz and its precincts that historically belonged to the lands of Belz. The territory of the preserve in Belz embraces 36.8 hectars and consists of four separate preservation zones: 1) tract “Zamochok” – former princely town with subburbs; 2) the Downtown – a locational town of the 14-16th c., where a number of architecture of 17-18th c. and valuable historical buildings are situated; 3) Christian cemetery with the curch of St. Paraskeva of the 18th c.; 4) Jewish cemetery of 18-20th c. and remnants of defense shaft of the 17th c.
In February, 2010, The State Historical and Cultural Preserve in the Town of Belz became the collective member of Ukrainian National Committee of International Council on Monuments and Sites (ICOMOS UKRAINE). •	The church of the Assumption of the Blessed Virgin Mary in the town of Uhniv, the 17th c.
•	The church of St. Mark in the village of Variazh, the 17th c.
2. An archeological site of national significance: the hillfort of the annalistic town of Belz (tract «Zamochok»), the 11-14th c.
•	Monastery complex of the Dominicans Fathers: cell carcase with a tower (the Town Hall) of the 17-20th c., remnants of the church of 16-18th c., a bell-tower of the 18th c., monastery walls. 4. 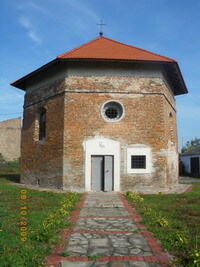 A historical site of local significanse: the place of the Jewish religious centre, the 19th c.
5. Site of monumental arts of local significanse: fresco painting in the town hall of the monastey complex of the Dominicans Fathers. In November, 2008, the agreement on transboundary collaboration was signed between Gmina Bełżec of the Republic of Poland and the State Historical and Cultural Preserve in the Town of Belz. The anchor of the agreement is the development of the tourism industry. In 2008-2009, an international transboundary route “Belz- Bełżec” was created. The length between destinations in the town of Belz (Ukraine) and Gmina Bełżec (the Republic of Poland) is more than 100 km across the border area of both countries. 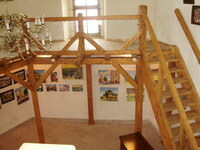 In Belz, international art plain-airs, in which painters from Ukraine and Poland participate, are held. The town was included to the international tourist cycling route “Across Sites of Belz Land”. The web-page of the State Historical and Cultural Preserve in the Town of Belz is the result of the collaboration with participants of the international volunteer camp “Following ancient history” in August, 2009. The project is funded by foundation „Memory, Responsibility and Future” and Foundation named after S. Batoriya. Since 2010 the international folk festival of three cultures – Ukrainian, Polish, Jewish – “Belzka Brama” (“Gates of Belz”) is held in Belz. Belz is the place of pilgrimage for Belz Hasideans, who visit the ancient cemetery with the graves of thaumaturgy rebbes from the dynasty of Rokeachs, the place of synagogue, Beth Midrash, House of Rabbis destroyed during World War II, and also the only in Ukraine restored building of Mikveh of the 19th c.
Annually, in August, pilgrims set off on foot to Częstochowa (Poland) along the route of the thaumaturgic icon of the Blessed Virgin Marry to the Jasna Góra in 1382. This icon is widly known as the Black Madonna of Częstochowa, and now is regarded a patron and defender of Poland. In a sign of Her residing and making wanders in Belz, in the chapel in Zamochok there is located the copy of this icon, prised to the community of Belz by Polish partners. At the entrance to the chapel, there is immured unique stone relief of St. Valentine, which was by wander saved during the time of destortion of sacral monuments. That is why, since recently, this chapel has become the place of pilgrimage and the main attrcaction of Belz.